The 88-year-old Hungarian-American said the United States “needs to crack down” on the likes of technology companies ZTE and Huawei. 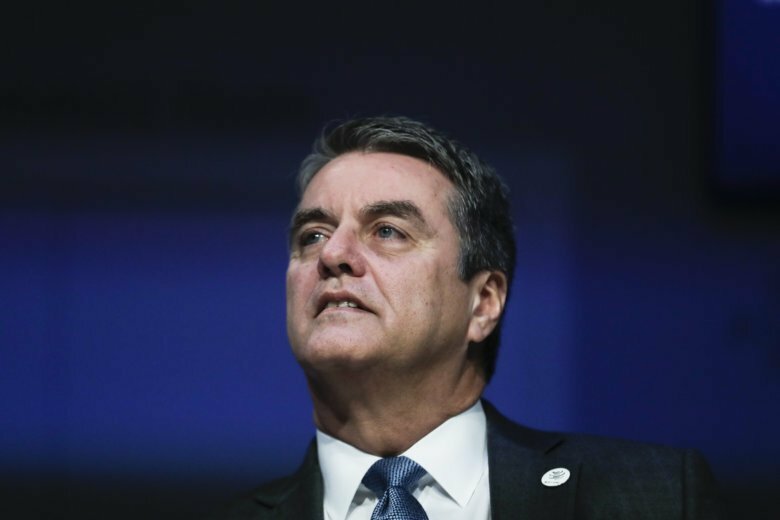 WTO Director-General Roberto Azevedo pointed to comments from officials that suggested “some progress has been achieved and that there is some degree of optimism in the conversation” between Washington and Beijing. Speaking Thursday to The Associated Press at the World Economic Forum, Azevedo also said that in case of a no-deal or “hard” Brexit, preferential trading conditions on about 60 percent of trade in British goods would go away, meaning that the tariff levels on them would change. Azevedo also acknowledged a critique by Japan’s prime minister a day earlier was “fair.” Shinzo Abe said major changes were happening in world trade, and said the WTO was “behind the curve” and not keeping pace. “The reform of WTO is precisely what we need to do to fix that,” Azevedo said. Shouting “anti-capitalista” and other chants, hundreds of protesters have demonstrated in Davos — insisting the elite attendees of the World Economic Forum across town were more about helping themselves than a troubled world. Socialists, environmentalists and others waved banners and signs that read “Davos Stinks” or “Let them eat money” while braving sub-zero temperatures in central Davos. Thursday’s demonstration was originally planned in part to protest against President Donald Trump, who had been expected in Davos this week before cancelling his trip over the U.S. government shutdown. The protest went ahead anyway, training some anger at Brazil’s new nationalist President Jair Bolsonaro — who did attend. Li didn’t single out culprits. But the reference seemed clear: The United States is restricting Chinese investment and has imposed taxes on $250 billion in Chinese imports. Secretary-General Antonio Guterres offered a message of inclusion for those in “rust belts” around the world, saying that insecurity about jobs and livelihoods being lost requires more attention. For many years, political establishments and international organizations “let these people be left behind,” he said. We need to understand their “grievances” and the “root causes” of their opposition to multilateralism championed by the United Nations, Guterres said, adding that it’s “not enough to vilify those that disagree” with multilateralism. Irish Premier Leo Varadkar says Britain will face “enormous difficulties” if it crashes out of the European Union without a deal that could leave it unable to strike trade deals with other countries around the world. Speaking on the sidelines at the World Economic Forum, Varadkar said Britain would not only be outside Europe’s single market in a “no deal” scenario, it would also no longer be part of the EU’s trade deals with the likes of Japan, Canada and South Korea. One of the arguments made by those wanting a “no deal” Brexit is that it would allow Britain to strike trade deals around the world immediately. Bank of England Governor Mark Carney says Britain’s banking system is in good shape to deal with the prospect of the country crashing out of the European Union on March 29 without a deal. However, Carney said many logistical issues at ports and borders will not be ready in the event of a “hard Brexit” that would see tariffs imposed on British goods and other restrictions imposed on trade. Though the Italian government has softened its position slightly after the EU threatened it with legal action, its deficit is still higher than the EU had wanted initially to reduce Italy’s overall debt. Poland’s premier, Mateusz Morawiecki, agreed that the EU “should apply the same standards for different member states” but said that Italy is not being treated in the same manner that France was previously. France’s relatively high deficit over the past few years was widely seen as being tolerated by the EU. The head of the World Trade Organization warned that the global economy would plunge into the “Dark Ages” without free trade. But she said the momentum toward freer trade hasn’t stopped, noting that 11 Pacific Rim countries went ahead with a regional trade pact even after Trump withdrew from the deal in 2017 and that the EU has recently negotiated trade agreements with Japan, Canada and other countries. The fallout from developments in Venezuela and uncertainty over Britain’s exit from the European Union are set to be key points of discussions Thursday at the World Economic Forum in the Swiss town of Davos. Following two days when much of the debate has centered on issues related to global trade, particularly the dispute between the United States and China, and climate change, the world’s political and business elites are digesting what’s going on in Venezuela, after the U.S. recognized opposition leader Juan Guaido as interim president.